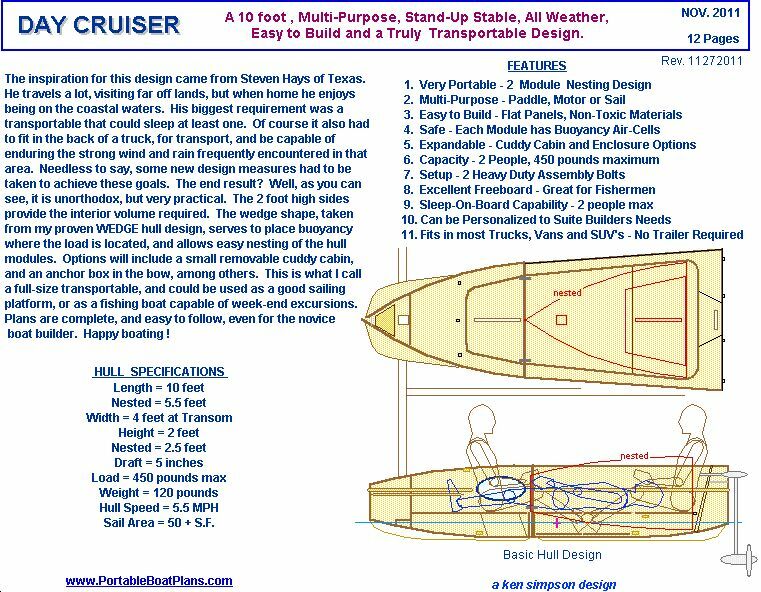 The DAY CRUISER design was suggested by one of my readers, Steven Hayes, for a seaworthy portable boat that he could spend a weekend on. That meant "sleep aboard" in his language. This is the first of my designs to embody huge freeboard and an outboard motor capability, and yet be able to convert to a 2 part hull for transport. 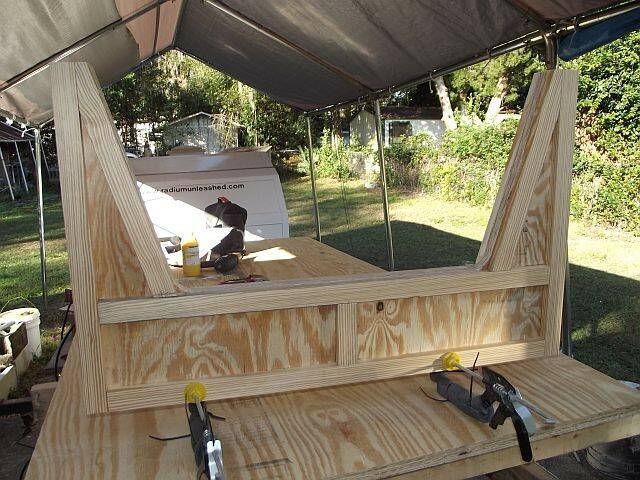 The end result is a hull with a load capacity of over 450 pounds, a wide beam at four feet, and the ability to re-configure the seating to make into a bed platform for two. But, this was not all. It would be "nice" if the boat could also be outfitted with a sail, rudder and daggerboard for casual day sailing. Naturally, built-in safety buoyancy and dry storage was a given, as well as an optional anchor well. After all, this is intended to be an extended duration little boat. Once the plans were sufficiently completed, minus the sail rigging, others became interested in the design, and construction began on multiple builds. The following pictures give a good idea of it's size and configuration. 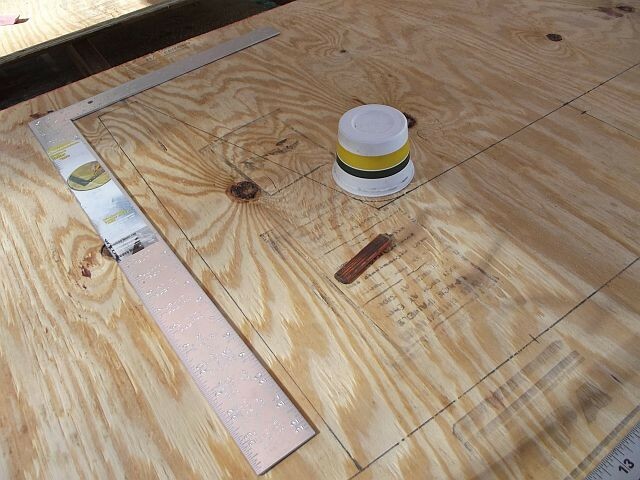 Initial plywood layout of the bulkheads. 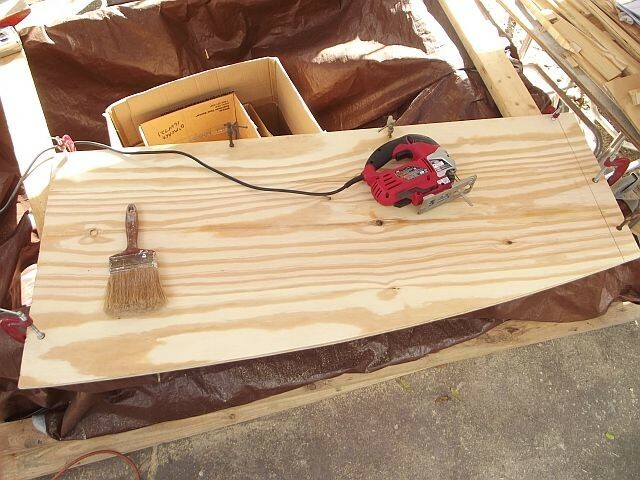 Cutting of the side panels. Both done at the same time for uniformity. Bulkhead assembly. Again, both clamped together to insure they are the same. The rear module nearly complete. 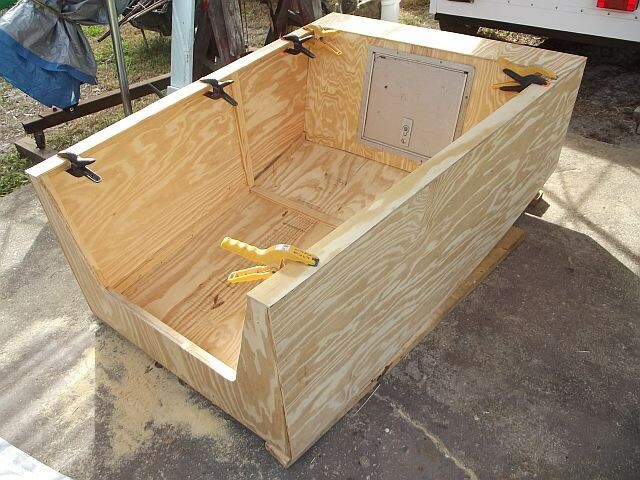 A large hatch installed in the aft compartment. As you can see, the high sides provide ample volume for the occupant to lay in a prone position. The intent is to add a cuddy cabin, primarily for weather protection, and a snap down tarp to cover the open cockpit area. In the sail version, a boom tent can be developed for even greater room utilization. The following drawing gives some indication of the possible options available to the builder. Much of the finish detail is still in the design phase, waiting feedback from the builders. All agree that is should be a good stable platform from which to work, and variations in the plans have already been implemented. As building continues, additional photos will be posted here. To me, the old adage, "a picture is worth a thousand words", is as true today as when first written. 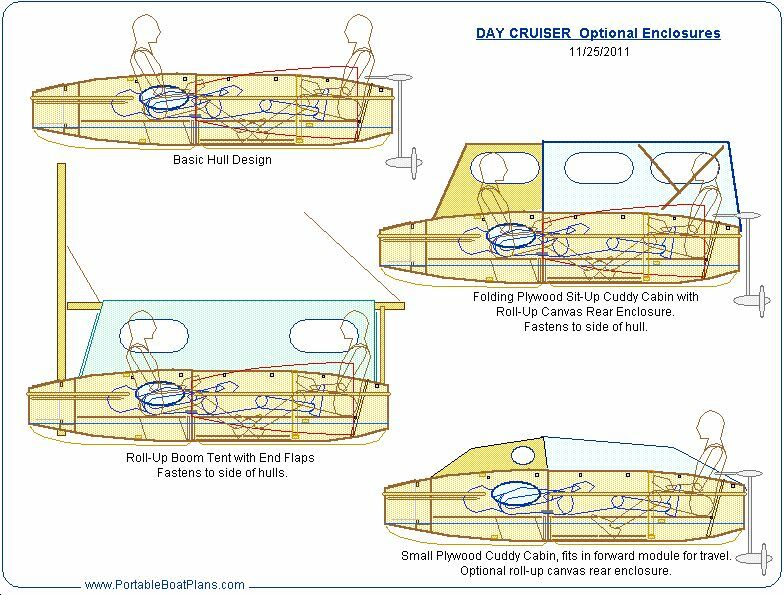 If you have any interest in the DAY CRUISER, send an email with questions or comments, and I will respond promptly. Select the HOME Tab to return to the Main Page. Thank you for your interest.